Besides a decent roster of games based from children’s television shows, relativity unknown developer High Voltage Software hasn’t done a lot. 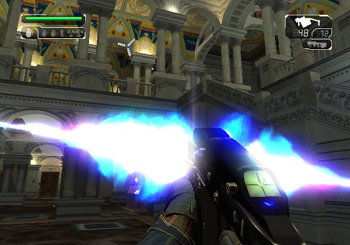 They aimed high to please with the graphically impressive Wii exclusive FPS, The Conduit as their first major release. Receiving a considerable amount of hype and general interest on both the Internet and in magazines, The Conduit is certainly on quite a few people’s “want to play”Â lists. But with the game’s adherence to a genre that usually excels on platforms other than Nintendo’s casual console, I for one was very curious as to how the product would turn out as a whole. 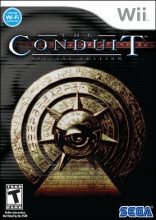 The plot of The Conduit sees you as the protagonist Michael Ford, a secret agent at the government’s disposal. The story revolves around a series of strange events happening in futuristic Washington D.C. These various events include, but are not limited to, a viral infection transmitted via the water supply known as “The Bug”Â, a high-scale terrorist attack on the Washington Monument, and humans suddenly succumbing to some kind of alien brain screw that makes them violently attack those they normally would not. Needless to say, things are not going well for the Washington D.C. of the future. The storyline works to uncover the reasons behind these bizarre events, and you play through it by way of dialog sequences between Mr. Ford and several generally dull characters. A fair amount of political intrigue is rolled into the stereotypical sci-fi pander, but none of it is really portrayed very well by way of exposition, and even less of it is truly interesting. You’ll know who’s ultimately going to betray you quite early on in the game, and unless you haven’t indulged yourself in much sci-fi themed fiction, you’ll probably have a good idea on where things are going long before they get there. The story does its job by giving the game some form of direction and purpose, but the concepts and characters are far too typical and cliché to be memorable. Off the bat, I’d like to mention that technically, The Conduit is easily among the most visually impressive games I’ve seen on the Wii console. Both the environments and characters are rendered with considerable detail, and there’s plenty of lighting and texture effects put to work in the visual aesthetic. Explosions look really nice, and even during the most enemy heavy firefights, the framerate remains smooth and precise. That being said, unfortunately, the art direction in The Conduit is on greatly akin to the ho-hum story; that is, it’s pretty much devoid of any genuine creativity or personality to speak of. The warning signs of this disappointing conclusion were in place regarding the visual presentation of The Conduit as far back as the when the first images of the main character, Michael Ford, were released. The generic body suit-like “future armor”Â and dramatic virtual reality style sunglasses that make up Mr. Ford’s costume are laughable at best, and look like something you’d expect to see on a character in some low-rent G.I. Joe cartoon rip-off. Things aren’t much better in regards to the insect like alien enemies, known as “The Drudge”Â, which are rendered with models that could easily be mistaken for the same alien raiders in a number of other sci-fi themed video games that have come before The Conduit. The environments also all have a similar air about them, even though they are meant to all be different locations. Honestly, technologically strong visuals are wasted if somewhat creative and interesting design isn’t in place. Though I was impressed such detail and technical quality was pulled off in a Wii game, I was almost instantly bored at what I was looking at. The voice acting in The Conduit ranges from less inspired to decent. The dramatic tone that Mr. Ford, your main character, always speaks with is fitting, but it is a bit ridiculous at times. Other acting does its job, but also falters as the conversations themselves serve as little but forced explanation of the following mission. The soundtrack is of reasonable quality, consisting mostly of stereotypical rolling orchestra fare with the occasional muted techno beat. It does its job, but much like most of the aesthetics we’ve discussed that make up The Conduit, it’s nothing memorable in the slightest. The sound effects such as various types of gunfire, ambient noise, and explosions are accurately portrayed. Probably The Conduit’s best feature would be its near flawless integration of the Wii Remote controls. Simply put, shooting enemies feels great in this game, and at its heart, that’s what an FPS shooter is truly about (unless it’s Condemned). The Conduit certainly features some of the most precise controls I’ve experienced in a Wii game. 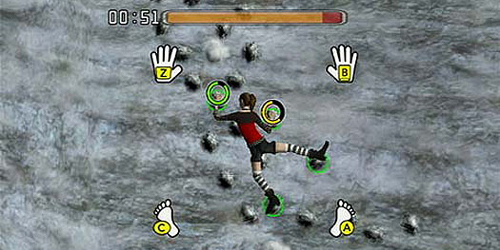 Aiming is pin point precise usually, and even melee attacks that require you to thrust the Wii Remote outwards can be performed without a hitch. It’s because of this that the game can offer some really solid FPS shooting fun, provided you’re not bored to tears with the lackluster plot and visual presentation. Functionally, The Conduit is a by-the-numbers FPS. You’ll move around any given stage until you discover enemies, who will obviously shoot at you as you inevitably shoot back. In between the shooting action, The Conduit will at times require you to use the ASE (All Seeing Eye), which is a device of alien origin that can see the unseen, and even phase previously intangible objects into the game environment. 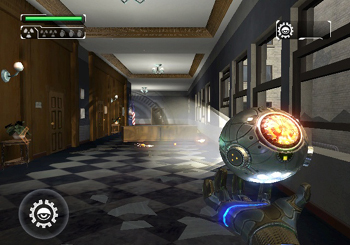 To break up the monotony of Wii Remote shooting bliss, someone at High Voltage though it would fun for you to use this ball to scour the walls of various rooms in search of alien graffiti or hidden devices to unlock doors that impede your progress. The drab nature of looking around for hidden stuff in a room, and the occasional uninspired key search the game will set you out on, is indicative of the other uninspired design choices I’ve already mentioned that mar the experience of the game collectively. I understand the need for some kind of alternative diversion in an FPS title in this day and age, but lame drek like this really leaves The Conduit with only its exceptional shooting action as the sole reason to play it, and even though it’s extremely solid, it will undoubtedly wear thin after a while. The Conduit offers a traditional multi-player mode that offers three different types of matches. Up to twelve players can go at it either on teams, in a free for all, or in a capture the flag style game. There’s a number of different secondary rules hosts can tack onto their game as well. Since it’s not bogged down by the drab and lifeless single player campaign, and it focuses almost exclusively on the sharp controls, multiplayer mode in The Conduit is definitely a lot of fun. Again, it’s nothing remarkable or unique, but the great Wii remote shooting adds something special to the tired multiplayer FPS formula. Wii players looking to do some fragging might just want to give The Conduit a look. Another considerable issue I had with The Conduit is the constant fluctuation of the difficulty. This difficulty in particular comes into play as enemies randomly storm rooms as you enter them, gunning you down almost instantly, with little to nothing you can do in retort. The final scenario of the game sees you riding an elevator at the start of the mission. When the elevator stops, and the doors open, you’ll be instantly bombarded by a room of unmerciful enemies who will most likely do you in before you have the chance to react. There are, unfortunately, quite a few similar instances to be found through The Conduit’s single player campaign, and they are all equally frustrating. Other maddening experiences come by way of the several times the game will have you disarming bombs, that are extremely difficult to see, while enemies take annoying pot shots at you as you attempt to advance. These instances, though small on their own, add up to some noticeable balance issues. In a lot of respects, it seems The Conduit was designed to literally rebel against the idea of creativity in video games. The art direction is bland and uninspired, the story trite and cliché, and if it wasn’t for the fact that we play the game with a Wi-Remote, the entire gameplay experience would be by the numbers when compared to the considerable amount of other FPS titles one may have played upwards of a decade ago. Even given the sleek controls, it has been quite awhile that I had to fight so hard to maintain interest in a game as I did with The Conduit. As I previously mentioned, I genuinely had to struggle to maintain interest in the campaign portion of The Conduit. Depending on how much you can appreciate and get into the solid controls, this will ultimately decide what makes or breaks your experience with The Conduit, as there is little else to get excited about if you have no intentions of playing the game’s multiplayer mode. The multiplayer mode is good fun for sure though, and the variety of game modes could see you coming back for a decent while. 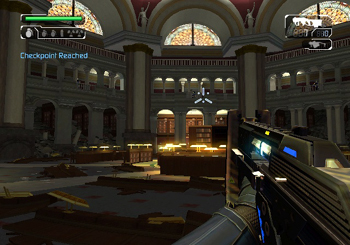 The Conduit has garnered a considerable amount of attention, mainly for being a Wii exclusive FPS. I believe the reports of the game being uninspired and dull aren’t enough to completely burn out this built up interest, and I’m certain a number of Wii owners have and will still want to check out the game themselves regardless. The FPS genre has always been a popular one, and if your game is amongst the few titles that offer the experience on a particular console, it’s hard to imagine that the appeal isn’t there. 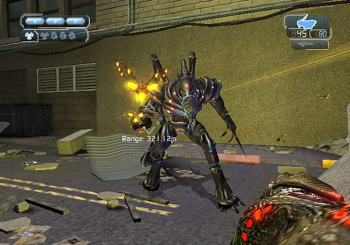 The Conduit offers Wii-Speak functionality during multiplayer matches, but it only works if the other players you’re playing with are friends. This can certainly be disheartening if you want to jump right into a complete multiplayer experience with the game, as you can’t just jump into the game and talk to people, as you could in a 360 or PS3 FPS. Sleek, precise game control and technically impressive visuals are among the few positive marks one can give The Conduit. The lack of originality is, frankly, mind-boggling, and this is a problem for both the visual aesthetic and the general flow of the gameplay. Coupled with some really frustrating set-ups in quite a few missions, the value of The Conduit’s existence ultimately rests solely on the fun you might be able to have with the multiplayer modes. Perhaps High Voltage can utilize the nice control scheme and efficient graphics on a more inspired sequel.